LV range contains lower-level voltages ranging 50 – 1000 volts. Examples include 120, 220, 230 volts at our homes. Technically the name low indicates the lower range, still, the voltages are dangerous and can lead to lethal accidents. One should take care while handling such voltages. 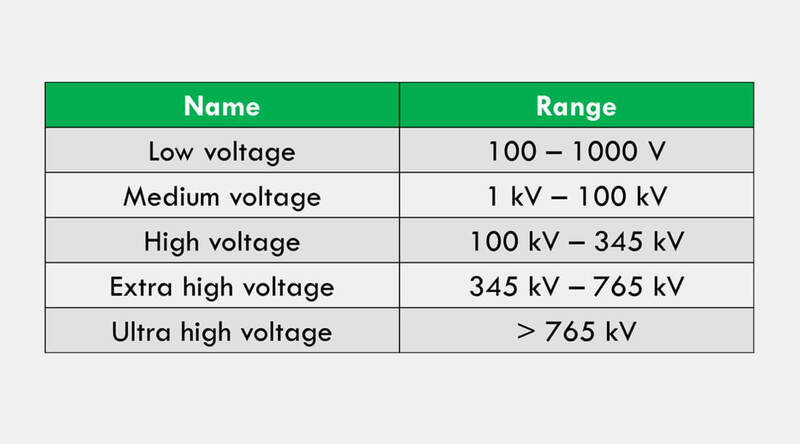 Voltages higher than 1 kV but lower than 100 kV are classified as medium level voltages. Electrical distribution and secondary transmission are usually done within MV range of voltages. Voltages higher than 100 kV but lower than 345 kV are termed known as HV. The secondary transmission and in some countries the primary transmission is done in HV range. Voltages higher than 345 kV but lower than or equal to 765 kV belong to EHV class. Many countries of world use 465, 500 kV for transmission purposes. Many countries are utilizing 765 kV for transmission purposes. The higher you go the lesser are the losses. Voltages higher than 765 kV are graded as UHV. For lower voltages (<765 kV) AC systems are more common. For V > 765 HVDC is preferred for transmission purposes. HVDC links of 800, and 1100 kV power transmission networks are currently working in Indian and Chinese power systems. UHV also finds its applications in HV lab Engineering research where 2500 kV, 5000 kV systems are used in experimentation. can someone send me complete pdf book of these uploded post .